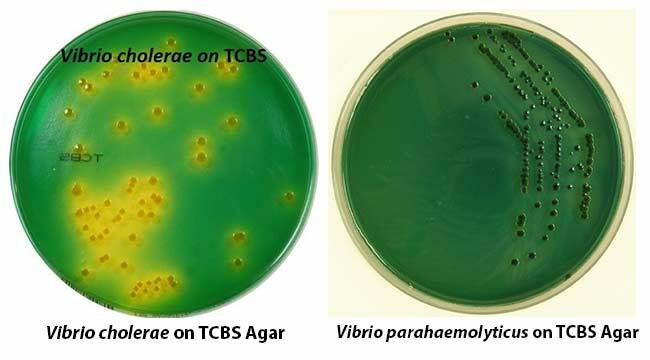 TCBS Agar is used for the selective isolation of cholera vibrios and Vibrio parahaemolyticus from a variety of clinical and nonclinical specimens. Vibrio species are most widely recognized for their role in human intestinal infections, and cholera and V. parahaemolyticus diarrhea are important worldwide. All pathogenic Vibrio spp., except Vibrio hollisae, will grow on TCBS Agar. The original formula developed by Nakanishi was subsequently modified by Kobayashy et al. for the selective isolation of pathogenic Vibrio species. Final pH 8.6 +/- 0.2 at 25 degrees C.
TCBS Agar is used for the selective isolation of Vibrio cholerae and other enteropathogenic vibrios. Thiosulfate and sodium citrate, as well as the alkalinity of the medium, considerably inhibit the growth of Enterobacteria. Ox bile and sodium cholate slow the growth of enterococci and inhibit the development of Gram-positive bacteria. The acidification of the medium resulting from the fermentation of sucrose by Vibrio makes bromthymol blue turn yellow. Bromthymol Blue and Thymol Blue are pH indicators. Using thiosulfate as a sulfur source, the production of hydrogen sulfide is visualized in the presence of ferric citrate. Yeast extract and peptone provides the nitrogen, vitamins, and amino acids in TCBS Agar. Sodium chloride provide optimum growth and metabolic activity of halophilic Vibrio spp. Agar is a Solidifying agent. An increased pH is used to enhance growth of Vibrio cholerae, because this organism is sensitive to acid environments. TCBS Agar is used for the isolation of Vibrio cholerae and other enteropathologic Vibrio (in particular Vibrio parahaemolyticus) in fish, seafood and biological samples of animal origin. TCBS agar has also been used to control outbreaks of the crown-of-thorns seastar (Acanthaster planci). Due to nutritional variation, some strains may be encountered that grow poorly or fail to grow on this medium. Further tests are necessary for confirmation of Vibrio spp. On initial isolation, V. parahaemolyticus may be confused with Aeromonas hydrophila, Plesiomonas shigelloides, and Pseudomonas spp. Sucrose-fermenting Proteus spp. produce yellow colonies which may resemble those of Vibrio. TCBS is an unsatisfactory medium for oxidase testing of Vibrio spp. A few strains of V. cholerae may appear green or colorless on TCBS Agar due to delayed sucrose fermentation. Biokar Diagnostics – Rue des Quarante Mines – ZAC de Ther – Allonne – B.P. 10245 – F60002 Beauvais Cedex – France. what is the expiration date of the TCBS media once made and poured into the petri dishes.